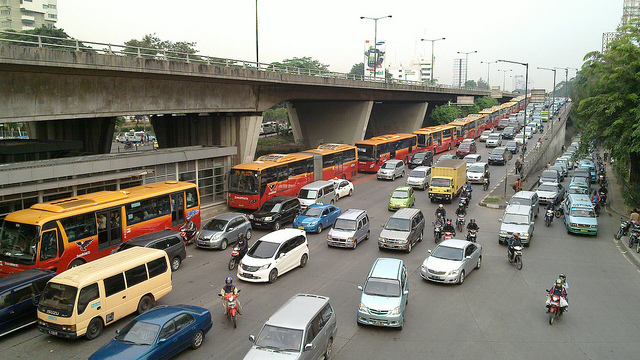 Jakarta plans an elevated bus rapid transit (BRT) line to combat the city’s chronic congestion. Photo by nSeika. Jakarta, which is expected to “attain total traffic gridlock” by 2014, is planning a $235.4 million, 7.1-kilometer elevated bus rapid transit (BRT) route as an initial line of a future network of elevated Transjakarta BRT network. Islamabad’s Capital Development Authority has launched the bid process to develop a bus rapid transit (BRT) network, complementing similar studies by the Asian Development Bank. Toronto’s controversial OneCity Transit Plan will be up for a vote by Toronto’s City Council next week, and it would pave the way for a $30 billion, 170-kilometer light rail and busway expansion. The recent announcement of a $175 billion commitment to sustainable transport at the Rio+20 Conference has spurred the passenger car and rail transport manufacturer Bombardier to sign on to doubling the of urban transport by 2015. The Southern African Development Community (SADC) prepared a long-awaited regional infrastructure development plan that is projected to comprehensively overhaul transport, energy and water over 15 years at an implementation cost of $500 billion. The Economist Intelligence Unit released its rankings for the world’s most livable cities, accounting for characteristics like sprawl, green space connectivity. Hong Kong topped the list; Tehran ranked worst. Extreme weather conditions, exacerbated by climate change, is forecast to cost the European Transportation network €15 billion annually, largely due to increased delays on rail and roadways. As Cyprus assumes the European Union’s (EU) Presidency this month, Nicosia’s six-month term will focus on energy and sustainable development as a follow-up to June’s Rio+20 Conference. Fossil fuel-powered vehicles now constitute 67 percent of Bangalore’s air emissions, caused largely by diesel truck traffic through the city. For 15-to 29-year-olds globally, road crashes pose a greater mortality risk than HIV/AIDS, tuberculosis and malaria combined. A cycling summit was held in Bath, Great Britain to discuss the health benefits of riding bikes. On average 7,240 premature deaths occur annually due to poor air quality in Hong Kong, a city that is estimated to lose $6 billion annually in environment-related health costs. In an effort to make its transport farecards more akin to London’s Oyster Card, Manchester Metro is planning a universal tap-and-go farecard to be in place by 2013. 106 students entered Jamaica’s Health and Road Safety Council’s inaugural Road Safety Poster Competition. The Health and Road Safety Council awarded students cash and prizes for their participation.